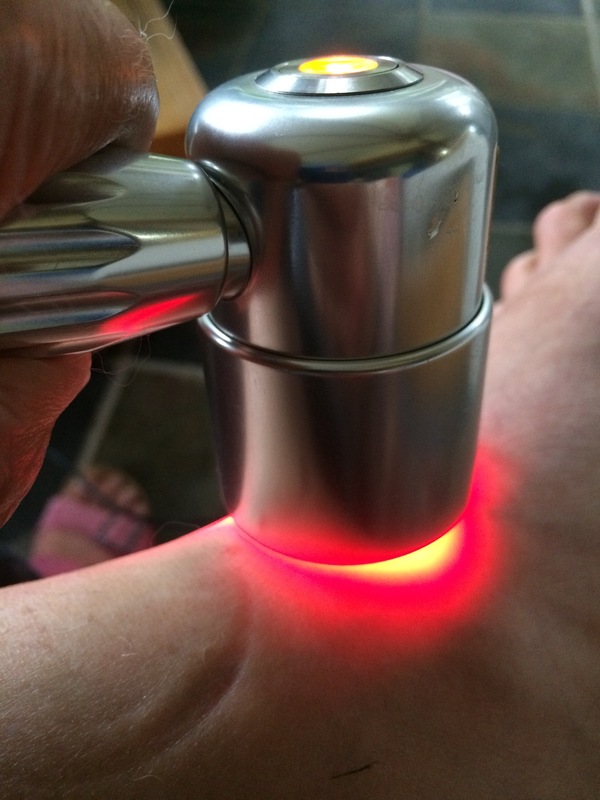 I’m using cold laser therapy to encourage my posterior tibial tendon to heal. Healing soft tissue injuries and wounds can take a long time — when Freedom strained his check ligament a few years ago, he was off for several weeks and had to be rehabbed on a slow, conservative schedule. One of the things I didn’t know about then was the use of cold laser therapy — also known as low level laser therapy — to accelerate healing. Cold Laser Therapy is a treatment that uses specific wavelengths of light (usually around 800 nm) to interact with tissue and is thought to help accelerate the healing process. It can be used on patients who suffer from a variety of acute or chronic conditions to help eliminate pain, swelling, reduce spasms and increase function. The light has the ability to penetrate 2 to 5 centimeters below the skin in the 800-900 nm range. Studies indicate that laser therapy can help relieve pain, reduce inflammation and increase microcirculation. Recently, Carol Gifford, who is the vet behind Walden Woods Animal Acupuncture started offering laser therapy as part of her practice. She uses it to help eliminate pain, swelling, reduce spasms and increase function and to stimulate acupoints for those patients who can not tolerate needles. (This, by the way, would be great for Freedom who has benefited in the past from acupuncture but who has a somewhat extreme reaction to having the needles inserted). This is where it hurts. injured this tendon, it inserts into your foot along your instep, runs up beside your ankle bone and attaches to the tibialis posterior muscle. It’s role is to stabilize your foot. 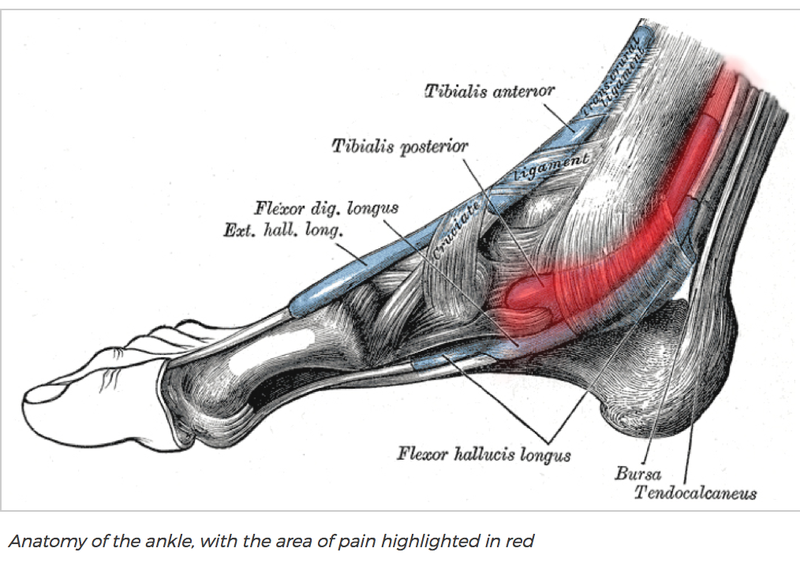 Any time you run or walk, your posterior tibial tendon locks your ankle in place, helping to hold your foot in a strong, rigid configuration when you push off the ground. It also functions to invert your foot, rolling your ankle to shift your weight to the outside of your foot. It is a very common injury and, as I can attest, it takes forever to heal. The area treated feels warm (not hot) for at least an hour. It’s not uncomfortable, but it feels different. There has been less pain and swelling, even after activities that generally aggravate it. For example, riding has been a problem because of the way that my foot pronates in the stirrup, but on Friday I was able to to ride for more than 2 hours and still felt okay. Of course, this is just anecdotal. I’m continuing to use more “conventional” therapies. I always wear shoes that support my arch (I live in Birkenstocks and use Birkenstock inserts in my other shoes), I’m doing physical therapy exercises, and have become an expert at applying KT Tape. But I’m optimistic. I’ve been trying to get this to heal for months and while my ankle is a lot better than it was after the initial injury, it’s never completely healed. It would be great if this was the answer! Have you tried cold laser therapy on your horses? Or yourself? I hope for a speedy recovery for you! My dentist uses a cold laser to promote healing, it seems to work splendidly! I’ve had the laser used on me when I got a tooth implant. The wound healed incredibly fast and I had no problems whatsover with the implant. The commercial grade lasers (type III and IV) are prohibitively expensive! My vet friend paid $14K for her laser. There are a couple of lasers in the $500 range that get good reviews, but that’s still a lot of $$. Because they are less powerful, you would need to zap the area for longer periods of time, but if it worked . . . I’m sure I could find lots of creaky joints that might benefit from having one. Let us know if you think it helps!